Choosing wallpaper is a neat way to dress up the iPad mini according to your aesthetic preferences. 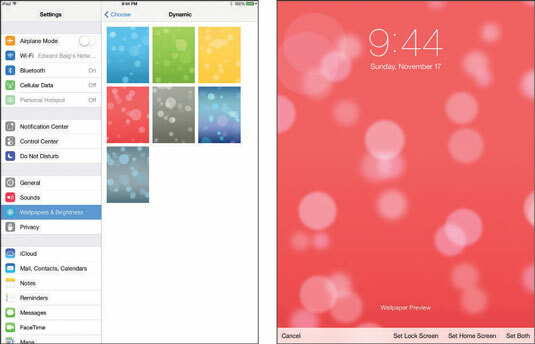 iOS 7 includes colorful dynamic animated wallpapers with floating bubbles that add a subtle dizzying effect. But stunning as they are, these images may not hold a candle to the masterpieces in your own photo albums. A list of photo albums appears with Wallpaper, a photo album of lovely images included with your iPad. Tap Apple Wallpaper (Dynamic or Stills) or one of your own photo albums in the list. Thumbnails of the images in that album appear. That image fills the screen. Set Lock Screen makes your selected image the wallpaper of choice when the iPad is locked. Set Home Screen makes the wallpaper decorate only your Home screen. Set Both makes your image the wallpaper for both the Lock screen and the Home screen. Cancel takes you back to the thumbnail page without changing your Home or Lock screen.